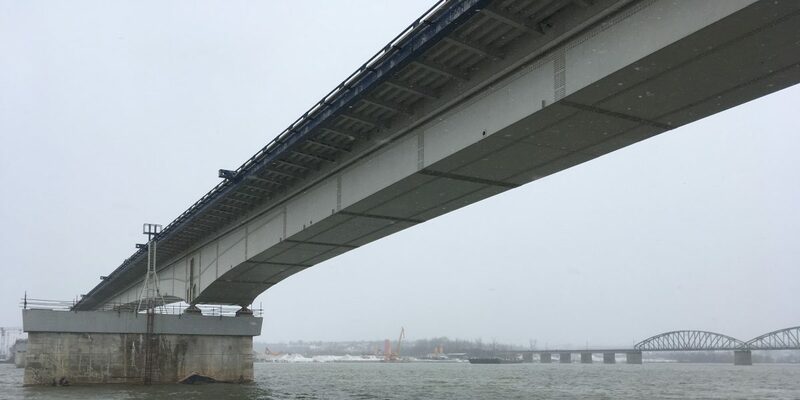 Ostruznica Bridge over Sava River is the part of Belgrade Bypass Project. First phase of the bypass, i.e. one lane of the highway has been completed in 1999 and reconstructed in 2003 after demolition NATO bombing in 1999. Second phase is the clone of existing bridge. New bridge over Sava is, with its silhouette, clone of the existing bridge structure completed in the first phase. Piers of the existing bridge, performed in the first phase, have been designed to carry both steel structures. Main steel box girder is a continuous girder over five spans 99 + 198 + 99 + 99 + 88m. Total weight of the main bridge steel structure is 4700t.